On Tuesday, April 25, 2017, ten SVRTC divisions were represented by members (Amelia, Brunswick, Cumberland, Franklin City, Greensville, Henry, Hopewell, Lunenburg, Nottoway, and Sussex) to learn about disaster recovery from Infrascale. 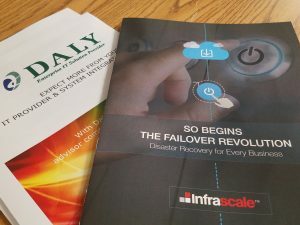 Larry Mogil, Territory Account Manager with Infrascale, gave members an overview of the disaster recovery service it provides. Mr. Mogil emphasized how costly the loss of time from an appliance failure can be to a company or school system. Another huge effect he discussed was the loss of productivity. “The chances are very high for most people to have a problem in the next 24 months”, he added. Mr. Mogil explained how ransomware attacks a computer and holds the data hostage. He equated disaster recovery and backup is like insurance. Two key concepts he discussed was that Infrascale provides cloud back-up and disaster recovery. Mr. Mogil answered questions from members and encouraged them to contact him at larry.mogil@infrascale.com with other questions they may have.